Crispy on the outside and juicy on the inside. Meet the burger of your dreams. 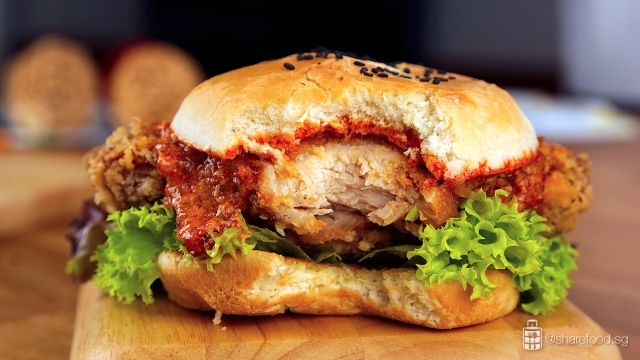 Make the juiciest and tastiest Prawn Paste Chicken Burger of them all! 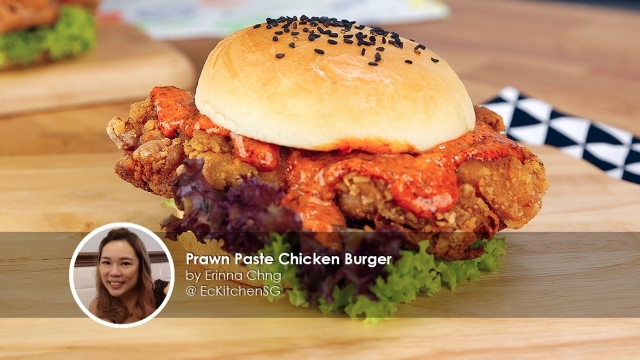 This Prawn Paste Chicken Burger recipe is shared by home cook Erinna Chng, who loves to cook traditional and modern dishes and shares all the amazing recipes on her website. Prawn paste chicken (Har Cheong Gai) is a popular Chinese dish that is first marinated in shrimp paste, then dipped in batter or coat with flour mixture and deep fried. The end result is a golden crispy chicken that is bursting with flavour. This juxtaposition of Chinese cuisine with the classic American burger works incredibly well. It’s a fantastic fusion of flavours that are really intense and satisfying, and you can play with really interesting toppings. The fried chicken leg is crispy on the outside and juicy on the inside. In this recipe, we used Kee Song boneless chicken leg as the meat is tender and succulent making each bite extremely satisfying. 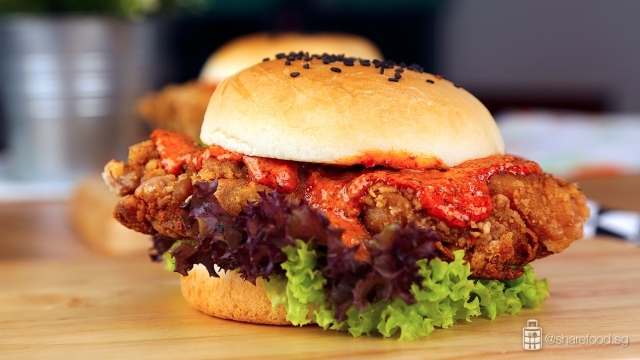 To serve the burger, lay a few pieces of green and purple coral vegetables on the bottom of the burger buns, place the crispy prawn paste chicken leg and drench over the sambal mayonnaise before closing the buns. 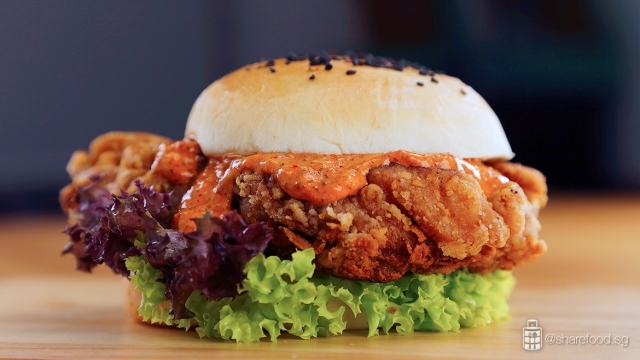 Mix sambal belachan and mayonnaise together and drench it over the crispy chicken leg. Sandwich it between buttery toasted buns and lay a few coral vegetable leaves on the bottom. And now you've got a burger unlike any burger you've ever had before! The end result is a golden crispy chicken that is bursting with flavour. In a large bowl, pour in ingredients (A). Mix evenly. Add in the Kee Song boneless chicken legs and coat it evenly. Place the chicken into a ziplock bag, release the air from ziplock bag, and put it in the chiller for at least 8 hours. This process helps to evenly marinate the chicken meat. Preheat the Air fryer to 200 degree Celsius. Mix ingredients (B) in a large mixing bowl. Wipe off excess marinade on the meat. Coat the meat with the flour mixture. Gently tap off excess flour. By tapping off excess flour, it'll give you a beautiful golden brown chicken when fried and with lesser harden bits. Mix sambal belachan and mayonnaise together in a bowl. Spread a thin layer of butter on the buns. Toast the buns for 5 mins on a frying pan. This gives the buns a bit of buttery sweetness. Build up an incredible burger. 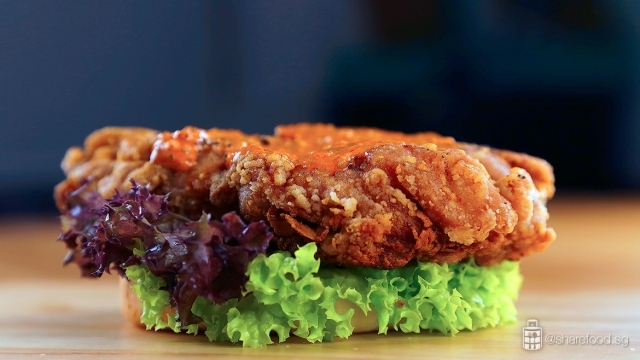 To serve the burger, lay a few pieces of green and purple coral vegetables on the bottom of the burger bun, place the crispy prawn paste chicken leg and drench over the sambal mayonnaise before closing the bun. Now it is ready to be served!